When raising and disciplining children, many parents rely on rules. In reality, though, the use of the term “rules” in parenting is often counterproductive. Rules are used to control—not to inspire. Although essential in games, rules are counterproductive in relationships. Think of it this way: If a rule is broken, a mindset of enforcement is naturally created. The adult’s thinking goes something like, “If I don’t do something about this, it will occur again and I’ll lose my authority.” The situation between the adult and child immediately becomes adversarial. Collaboration Improves Quality of Learning. Collaboration is a much more effective approach to improve and enhance learning. Collaboration structures student interaction for maximum participation. The traditional approach to involve students is to ask them a question. Students then compete for the teacher’s attention by raising their hands. Using this approach, the only winner becomes the student the teacher calls upon. In a primary class, one can see the hands dropping and hear the sounds of disappointment from those who were not called upon. Teaching is an art, not a science. There are many things in life that everyone knows exists but that cannot be quantified. Love and friendship are but two simple examples. Say, “I don’t want to win; I just want to understand what you are saying. My objective is to clarify, not influence. At the worst you have clarified. At the best you have minimized any disagreement. In any event, it’s good to know where you agree and where you differ. Your choice of influencing determines your success. Young people are influenced in one of FIVE ways that can be classified into two categories: external and internal. Rewards can serve as effective incentives—if the person is interested in the reward. School grades are a case in point. The reward of a good grade is important to some students but not of interest to others. If a good grade—or ANY REWARD—is not important to the person, that reward has little value as an incentive. Rewards can also serve as wonderful acknowledgements—ways of congratulating merit and demonstrating appreciation. But notice that these are awarded AFTER the behavior—not as bribes beforehand. If a behavioral change is necessary, the stress should be on the student—not the teacher. Without what I have learned from you I would never have made it in the long-term sub job in the Special Education Department here at school. At times I was alone with children who were constantly punished and rewarded. I started by not doing any of it but asking questions and having them reflect. They learned that no matter what they did I would not react to their behaviors—except to ask if what they were doing was appropriate and responsible. This is an example of how to have a student change attitude and behavior. While working with a middle school for three days, I was asked by the counselor to conduct a discipline counseling session. The request was to work with a student who was a major challenge to the school. The counselor sat in the session and observed how I used noncoercion and collaboration to prompt a change in the student’s attitude and behavior. I started the meeting by asking the student, “What was the situation that brought you to the office?” Alicia (not her real name) replied that she had called someone a bad name. Stress can be reduced by what we think. 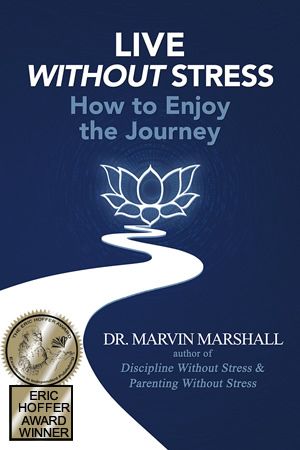 Some experts suggest that a little stress is good, but high levels of stress are harmful to most people. However, it is possible to perform well when relaxed (think masters of kung fu). In my opinion, that should be the goal: a classroom (and life) that is productive and virtually stress-free. “Counterwill” is the name for the natural human resistance to being controlled, and this includes discipline in the form of punishment being imposing by someone else. Although adults experience this phenomenon, we seem to be surprised when we encounter it in young people. Counterwill is the most misunderstood and misinterpreted dynamic in parent-child and teacher-student relationships. Whereas good relationships are important to girls, success is more important to boys. Hopefully, society is well past the “politically correct” theory (an oxymoron in a democratic society) that the ONLY difference between a male and a female is in socialization—that aside from reproductive organs, there is no difference between the sexes neurologically, psychologically, emotionally or how they should be disciplined. If learning is what we value, then we ought to value the process of learning as much as the result of learning. By nature, people are attracted to activities where they feel free of psychological or emotional pain. Learning is promoted in a climate where people feel safe and cared for. The adage, “People don’t care what you know until they know you care,” is applicable. Tom Sawyer was a much better psychologist than any behaviorist. Why? Because he inspired others to whitewash Aunt Polly’s front fence. He prompted them to feel good about doing the chore, because he showed them how much fun they could be having. He triggered the internal motivation that prompted them to want to whitewash the fence. Behaviorists believe that all behaviors are acquired through conditioning. They rely on external sources to actuate change. They completely neglect the internal, which is a prime reason that neuroscientists do not rely on these approaches for humans. Here is a better approach than relying on rules. Relying on classroom rules is a mistake-even though it is common practice. An understanding of each distinctive concept is essential for effective teaching. “The Brilliant Inventiveness of Student Misbehavior: Test Your Classroom Management Skills” was the title of an article in a well-respected educational journal. The article had some good suggestions. However, there was a glaring misnaming in that the article had nothing to do with classroom management. The article was entirely about discipline. So are many educators—even college professors. When speaking at an international conference on character education, a college professor said to me, “I don’t like the word ‘discipline’; it’s too harsh, so I use the term ‘classroom management’ instead.” This teacher of teachers had not a clue as to the differences. This is an explanation of how to have students want to do quality work. Competition increases performance but hinders much learning. One needs to look no further than the business or sports section of any newspaper to see the pervasiveness of competition. There is no doubt that competition increases performance. Athletic teams, bands, and other performing groups practice for hours spurred on by the competitive spirit. Fair competition is valuable and can be lots of fun. Competition in classrooms, however, is fun for the winner but is often unfair for the others because the same children usually win, making it uninvolving and dull for others. This is lesson from George Orwell. Eric Arthur Blair, better known by his pen name George Orwell, wrote one of the most popular 20th century English novels in 1949 entitled, Nineteen Eighty-Four (35 years in the future). The appendix in the book was referred to as “The Newspeak Appendix” and it described a new language, the purpose of which was to control thought. Orwell showed how language affects the brain, the mind (thought), and behavior. Using a butterfly analogy easily explains the Hierarchy of Social Development.